Please follow the thread rules. 1 request per person, do not modify requests, etc. I would suggest you edit the above post to simply state you misunderstood the rules of this thread or request a moderator remove it. Also please don't edit your first post to add the stuff you asked for in your second one. Thanks. JustTrogdor LINKED your post in this thread, in which you asked for The Predator and Permafrost dye. You are not supposed to remove your previous posts. You're supposed to make ONE post and EDIT it when it has been filled to state that it was filled. Not edit it to add in new items you want. It's like a genie. You get 1 wish and you can't ask for more wishes or change your wish once you've wished. I would really like to get any ascended armor insignia. I need 3 more to complete my armor set. I am using anything because I have 3 vipers exotic insignias to convert these pieces to yassiths. I am on EU RoF server. I'd also like to add, please just ask for a few things. Or if crafting something what you need to craft it. But please don't make a huge shopping list of gem store items and other stuff. I think some people are going a little overboard making a rather lengthy list of requests and sometimes including some of the most expensive things in the game. I may be wrong but I don't think that is the idea of this thread. My suggestion, one or two reasonable things you really want, or as stated if you have a crafting goal what you need to craft said item, not half the gem store (hyperbole of course) and all the fancy stuff you ever dreamed of. I don't think the intention of this thread is to work like your Amazon wish list. Edit: This isn't the "What's the most I think I can get from this?" thread. It's the "I ask because it is something I really want but can't get on my own or need help with," thread. Don't forget to follow this thread once you receive what you asked for (or even if you didn't) to see if you can help others out as well. You know the whole paying it forward sort of thing. That's what makes this thread work. Jesus, when did this thread go from being about doing something nice and meaningful for someone in the old forums to "I want a legendary", asking for 3k+ items or posting a shopping list of expensive kitten you want? This has really been ruined by greed from the original spirit of what it was meant to be. NA server thanks in advance. Wow that was fast someone sent me the kit Thank you! 100% agree with this. it is disappointing that this thread has become so riddled with greed that I hardly want to look at it anymore. Not to pile on, but I definitely agree. Cut the disapproval now, please. I believe the Point was made and that it was not only Greed that led the People here but also Hope, now let us return to the right Spirit of this Thread. To be honest. I feel really weird asking for anything but...I really would love to have the Spooky Mounts Pack (mount skins) or an Identity Repair Kit. If not it's cool thanks anyway. Mount skins would be amazing! I've been eyeing off those spoopy mount skins, but have been unable to purchase them because I've been trying to help my husband pay off debts. If possible I’d really love some help with tier 6 materials and mystic coins. I know it’s a lot to ask, but I’ve been working on a the legendary Frostfang for 6+ months and I’m at my wits end lol. I’ve sold everything but my soul away. Anything would be lovely. cheers! May as well make one request - I'd be much obliged if anyone has a Cosmic Mining Tool they'd like to gift. Would be awesome on my celestial themed mirage's appearance, though I keep missing the sale. No worries if not. Edit - I bought myself this mining tool when it was on sale on the BLTP recently, so please ignore this post. I would LOVE it, if someone could afford to gift me a Permafrost Dye. It's just ridiculously priced. If not, thanks anyway for the opportunity! oh dear. this kind of post just makes me love the game more and more my desire is only for me and you to enjoy the game! Just some Ascended Crafting Materials like Deldrimor Ingots, Elonian leather n Damask Patches, currently gearing my Necromancer (yea I know T.T) and frankly...not having a good time of having my bank account torn to tell n bank, that and splitting my time between Nevermore and Twilight...welll you get the picture. Thanks! EDIT: No longer available for purchase. I would love the Halloween Mount Skins. That's all. Thanks so much in any case! I'm trying to remove or edit my post, as it's a "Self-fulfilled Desire", but I can't seem to be able to do so. Heya. One thing you could do is to edit your original desire post (gear icon in top right of your post) and add an "Edit: Self-fulfilled" at the start. You could also highlight all of the original text and then hit the "Strikethrough" button to also show it as not being a desire post any longer. I am working on the new guild hall (got it to level 11 today) setting up the treasury with everything needed for the next set of upgrades. I could really use some help collecting any of the items for the next step of the Mine Excavation to boost the Aetherium capacity 2.
at the moment I need 200 Rune of Holding and 400 Elder Wood Planks, but any of the crafting materials need for the guild hall would help. Any and all help is welcome. That's the thing. I can change the text but it won't let me save the changes. That's why I said "remove or edit...unable to do so"
As a new player I can tell you I was disappointed to learn the outfit I bought (Profane) would take transmute charges every time I looted a new piece of equipment. I was hoping it was an outfit that would overlay your equipment. Can you trade transmute charges? I may have to buy them in the gem store. I'm level 30 now and have been completing maps to get them. If possible I would humbly ask for transmute charges and offer much thanks in return. Hopefully someone will gift you some since that is your request. That said a little advice as well if you don't mind. Honestly, leveling happens so fast I recommend not worrying too much about appearance until your character is L80 and has the gear you want as you will be upgrading armor and weapons a lot before then. You can earn transmutation charges in game as well as you noted with map completion. They are also rewarded from daily login rewards (3 on the 26th day of login rewards) and if you have an extra character slot you can roll a new character and do main city maps completions rather fast for a few extra. Also some PvP reward tracks seem to offer a fair amount from what I have read. I hope this helps with your issue. I wish they could be traded because I've been playing so long I have more than I ever use and I'd send you some of my extra if I could. In the mean time if there is an outfit in the gem store that appeals to you consider buying it instead of transmutation charges as outfits can be used on top of your armor skins with unlimited uses and no transmutation cost. Just make sure it is an outfit and not an armor skin. Do note though, outfits are all or nothing meaning you wear all of the outfit with exception of the helmet which has the option to be hidden. Then once you have the armor you want later on and know you will be keeping for a while you can turn the outfit off/deselect it and mix and match your armor appearance all you want with transmutation charges. Working on chuka and champawat and biggest headache i have are those amagalmated gemstones. Whatever constribution will be fine. Heys @JustTrogdor.7892 thank you for the advice. I ended up buying an outfit to go over my gear for now. 2. Tier 3 and 4 intermediate crafting mats because I literally never have enough of those. Any amount would do fine. 3. Tier 3 and 4 leather. I leather farm in Lake Doric when I can, but any little bit helps. Thank you to you!!! I won't mention your name but really, I was jumping with joy the moment I saw your mail! Sorry, I don't know how to edit my earlier post so yea. Omg, I wasn't really expecting it but it did really happen. It shows how people do really like the idea of giving and helping others! i would like one thing only and its a bit more gold, its not for me but for a present i'm doing for my fiance for her birthday. im farming a lot right now and even made a post on 9gag for the lulz and to my surprised people donated some gold. my deadline is April and this would be an amazing gift. im saving up to get eternity great sword for her mesmer and necro as she plays both. If you would please consider commenting in at least 5 different threads on the forums to be promoted to Member rank, which will remove the edit time limitation. You can then come back and edit your initial desire post to reflect receipt of items and give thanks. ~~I am a bit hesitant to post here because I do not want to feel guilty for asking strangers for items... but here I go... I stopped playing 2 years after leveling a mesmer to 80, I came back this year and enjoying doing fractal dailies after a random stranger introduced me to it. After some months I accumulated some gold and so I started to level-up some crafting and made it so my mesmer is now on t4. I only play mornings because of work and husband duties, so it is very hard to find some friends online that can play the same time as me. After gearing my mesmer, doing fractal dailies everyday I am starting to get bored (that is 4 months of fractal dailies and a few weeks of DS t get leadership runes) that I planned on 2 things, make a dps character or make a legendary. I saved up up to 350 gold that I was planning to buy a precursor for a sword or greatsword. but after PoF, I spent the gold to get the griffon mount, so I tried gambling on MF and end up with nothing... If it is not too much or if it is too much just please delete my post from your memory as I do not usually ask people for items or gold, I would like to have a precursor for a sword or greatsword. I bought the legend pre-cursor so I do not need any pre-cursor at the moment, so I think that counts as fulfilled. happy new year. I saved up up to 350 gold that I was planning to buy a precursor for a sword or greatsword. but after PoF, I spent the gold to get the griffon mount, so I tried gambling on MF and end up with nothing... If it is not too much or if it is too much just please delete my post from your memory as I do not usually ask people for items or gold, I would like to have a precursor for a sword or greatsword. No worries. It never hurts to post...just don't get your hopes up. Its tough to get a precursor...I've played since beta and N-E-V-E-R had a precursor drop. I encourage you to pursue crafting a precursor since that has been added. I am working on Nevermore and it is taking a while. (DISCLAIMER: I am NOT asking for anything along those lines, so please DO NOT SEND ME ANYTHING!! This thread helped me gather mats for Mjolnir and Winter's Presence way back toward the beginning of the original thread. This community is awesome!) I am slowly gathering things and saving some gold for when I need to buy some things. Someone would have to be VERY kind just to give you a Precursor...it has happened...but its very rare. If ever you need help getting to someplace or beating something in the journey to crafting a Legendary, please let folks on here know. Many offer to help if you can catch them in game or set something up in advance. I've just came back after a break and noticed that the elusive Cat Ears are on sale! Unfortunetely I'm completely broke. My beloved GW1 Mesmer was rocking Cat Ears along with Kurzick elite armor back in the days so it would be a kind of a memento. Edit: Thank You very much and Happy Halloween! Well... this is one in a lifetime opportunity to get something out of my reach. So it shouldn't be stupid to be bold. I always wanted to step into fashion wars, to shine even for a moment. But every time I make some money I had to choose between buying upgrades for my guild, making another step in my journey to legendary weapon, equiping one of my other characters OR buying apperance-related stuff. I like to do farming myself but I am getting stressed with gathering tools durability so my wish would be unlimited gathering tools. All 3 would be great but if not then mining pick or axe since those are most efficient? Thanks for considering! I got really burned out this Halloween by continuing to open Trick or Treat bags, convinced I could get Touch of Madness to drop. I worked out that if I had just saved the bags and spent them, I would have had enough gold to buy it, and then some. I farmed daily in the lab, and now that Halloween is ending I just feel terrible about the whole thing, I came out totally empty handed. I wouldn't ever except someone to gift me it, but I figured why not, thank you for even considering it/reading this. First of all, I'm sorry for my bad english as it is not my first language. I have a really bad ecto gambling habit and can't stop until I can't gamble anymore, which means I will only stop when I'm out of ecto and money. Because of that reason I can't save enough gold to buy gems. I promise if someone fulfill my wish I'll stop ecto gambling and won't even touch it ever again and will use my gold for someone in this thread. EDIT: I realized this might not work properly in Scenarios when there is great number of Desired Items, for example 100 T6 Materials. In such Cases marking the Post with 'Thumbs Up' would be a better choice to show you are about to help in some Way. So, 'Helpful' for complete fulfilment and 'Thumbs Up' for taking Part. I'm pretty new, been playing for about two weeks, but I'm absolutely in love with this game. If I had to pick one thing I desire, it would definitely be the Griffon mount. It's absolutely beautiful, and it felt so incredible riding on one for the questline. Plus I really enjoy exploring the world, and I feel like it would be so much easier with the Griffon.. I've got most of the achievements done, but I'm having a lot of trouble making the gold to buy all the items. If anyone could help me with this, even just a little, I'd be incredibly grateful! And an enormous thank you to Vaalen who sent me 115g! I can finally get my griffon mount, thank you all so much! I feel a bit weird about asking for stuff but here goes. If anyone can help with any of the unlimited use gathering tools, I would be very grateful. It's something that I think would make life a lot easier. Thanks. If anyone's feeling generous, I'd really appreaciate one skin mount contract for 400 gems. I opened three so far hoping I'd get the Twin Sands doge, but sadly I got 2 crappy skimmer mounts and 1 raptop mount. Needles to say, I wasted all my gold on those 3. This pretty simple. Since the start of the game I've always found all the available backpacks extremely obnoxious. 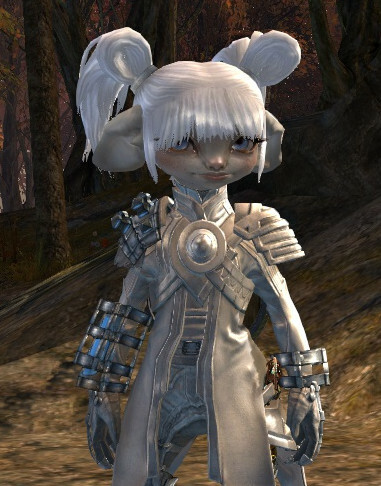 Now, when they add a really cool looking one which would suit my Magic Duelist mesmer it's only available via the Black Lion Chests :C Would really love to get a few shots on those but am really short on money and scared that I won't make it in time. Unfortunately, we're only allowed to make one request... period. Sorry, man. edit: I'm not sure if you want your name posted but thank you soo much for the 50 gold.